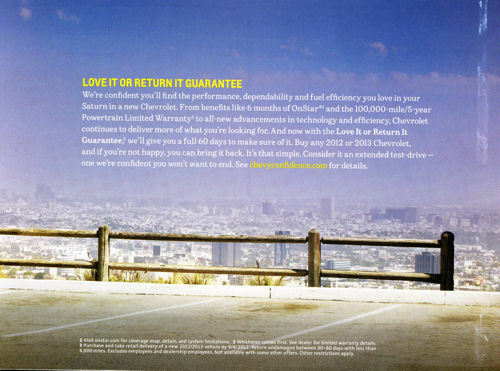 Over the summer I received a pamphlet in the mail from Chevrolet touting their summer-long "Chevrolet Total Confidence" pricing promotion. The cover of the mailing immediately caught my eye with the italicized words reading "the spirit of Saturn lives on." Unfortunately, the promotion was just that, a promotion. After initially hearing about the campaign, I thought perhaps GM was fundamentally changing the way is was going to market and sell Chevys. But instead, the promotion ended rather unceremoniously after Labor Day. 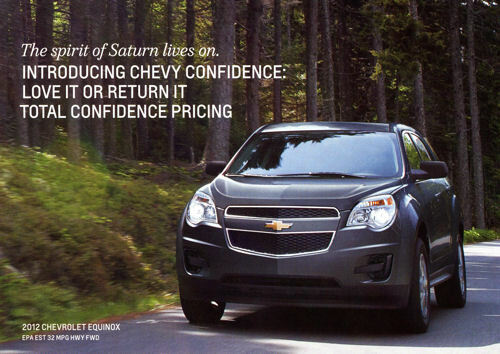 Its too bad, because I think between their formidable vehicle lineup and a long-term adoption of Saturn's proven retail practices, Chevrolet would be tough to beat. See the rest of the pamphlet below. General Motors will once again offer an employee discount incentive to help drive traffic into showrooms and boost August sales. The promotion, according to an Automotive News report published this afternoon, will start August 20th and will apply to all GM brands, including Saturn. It will reportedly run through the end of Labor Day weekend. 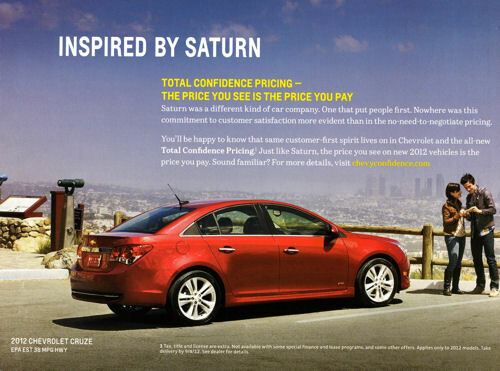 Are Shorter Television Commercials the Key to Increasing the Awareness of the Saturn Brand?